And Build Stamina and Fluency for Writing Workshop! 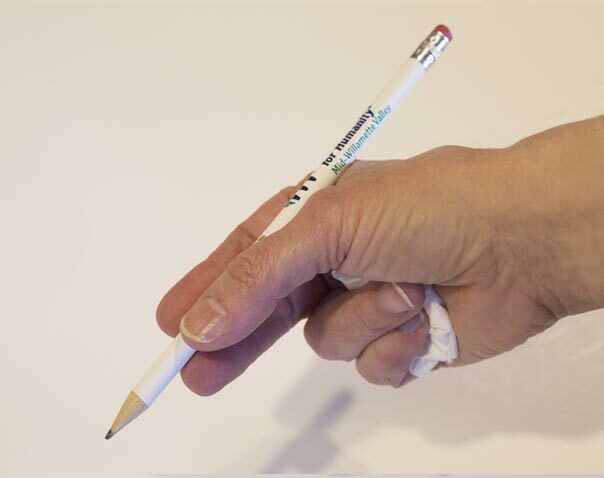 1) Intentionally develop fine motor skills and teach pencil grip. Differentiate instruction, recognizing the diverse 4-year range of skill development typical in most kindergartens. 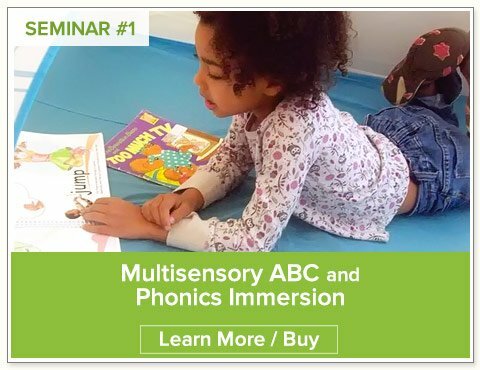 Use fingerspelling, games, and guided drawing to build finger dexterity, perceptual motor skills, and focus. Involve Parents as Partners—especially—with younger students. 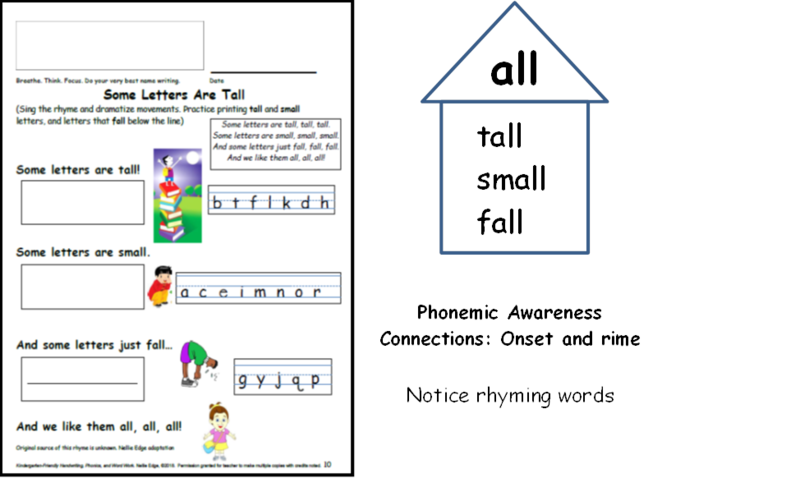 2) Involve Parents as Partners to teach handwriting with the letters in each child’s name. Provide families name-writing support beginning at spring registration (Kindergarten Round-Up) and the Back-to-School Kindergarten Family Scavenger Hunt. Give children and parents a crystal-clear learning target: A name-writing model. Expect namewriting practice daily at home and at school. Work on one letter at a time and expect daily improvement. See Name Ticket video clip on our website handwriting page for coaching model. 3) Teach the word “I” with top-to-bottom, left-to-right handwriting motions using skywriting, action-songs and chants, and guided writing. Enjoy art lessons on white boards using Total Body Response to Language (TBR) strategies. Teach horizontal, vertical, and diagonal lines with rich directional handwriting vocabulary. Provide individual coaching. 4) Provide instruction in “continuous motion letters” and “lift-the-pen letters” using engaging movement and drawing techniques: Children will learn to draw 3 kinds of stars! Use songs, dances, movement chants, and sky writing to build muscle memory and handwriting language. Invite students to fancy up their work with stars. 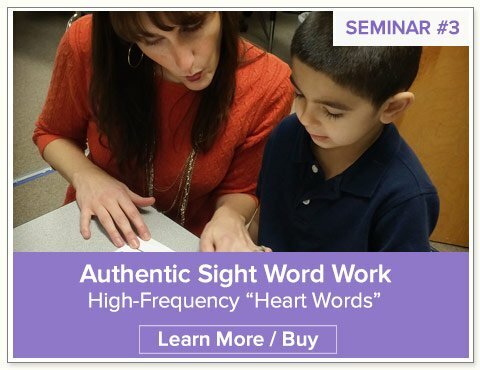 7) Use a multisensory approach to handwriting that simultaneously teaches high-frequency “heart words” and “heart word sentences” so there is direct transfer to the writing process. This is respectful of the time demands faced by today’s kindergarten teachers. 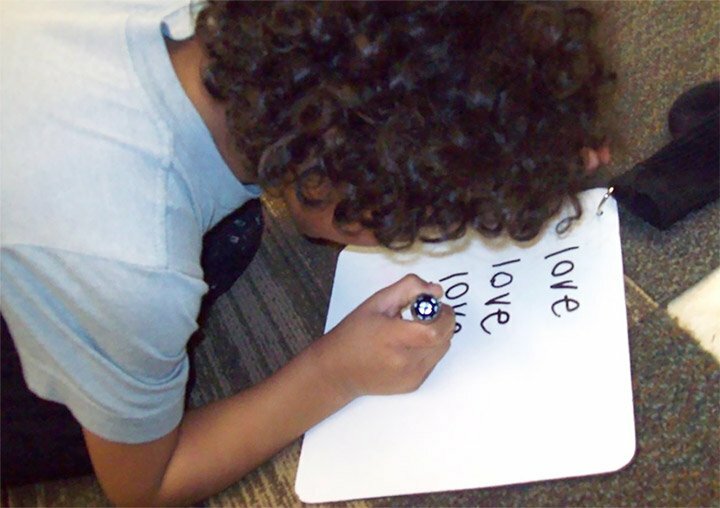 Note: 95% of the letters that young children use are lowercase, which is why our focus is on handwriting high-frequency “heart words” using lowercase letters. 8. 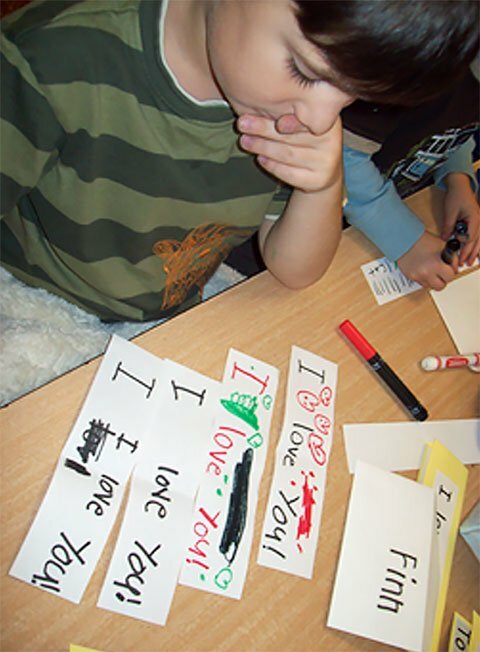 Teach students to observe closely and analyze the size relationship of letters within words. Start with our version of the traditional handwriting chant (sing and dramatize! ): Some letters are small… Use Total Body Response strategies and intensive individual coaching: Which letter is small? Which one falls? 9. Use the Optimal Handwriting Learning Model: Gradual Release of Responsibility with modeling, active guided whole group practice, individual practice, and personal application. Integrate the arts. Teach students why good handwriting matters! Give them rich vocabulary, authentic practice, and pride in doing quality work! Continue individual coaching with harder-to-accelerate students. 10. Engage students in self-evaluation and metacognition. Teach them to focus. 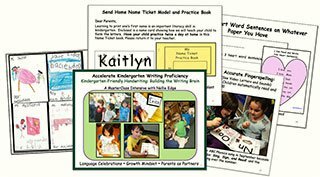 Give students growth mindset language and ownership of improving their handwriting. Wow! How did you learn to write that ‘y’ so well? 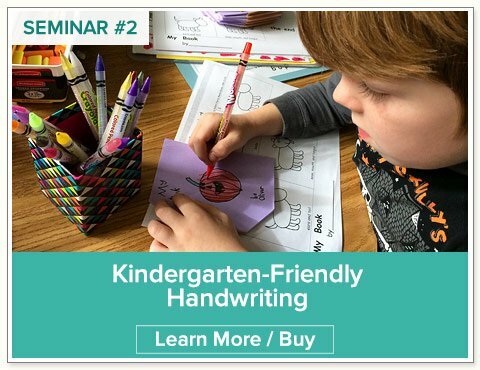 Kindergarten-friendly handwriting was developed BY kindergarten teachers FOR kindergarten teachers with documented action-research over 10 years. 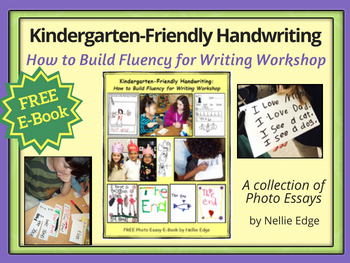 Want to learn more about this proven kindergarten-friendly approach to handwriting? Here are ways!